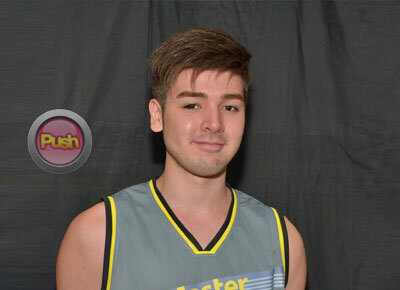 Andre Paras admits his top priority will still be his studies and basketball over showbiz. After the success of his first movie Diary ng Panget, basketball player-turned-actor Andre Paras admitted he enjoyed his first major acting project. “It’s my first film. I love acting. The project was for bagets so everyone can relate and so I just wanted to enjoy what I did and make people relate to it also. It's an opportunity that I've always wanted also and blessing din na naging blockbuster yung movie,” he shared. The 19-year-old UP varsity player said he is enjoying doing acting workshops when he's not in school. “I'm never the serious person but that's acting. I love to try different things also because dream ko talaga maging action star pero hindi pa nabibigay sa akin eh. Pero okay lang, thankful ako na they gave me this role so I can also prove to them that I am capable of acting in different ways,” he said during the Master Challenge presscon held last April 29 in BGC. Playing the role of the boy-next-door in Diary ng Panget got Andre a lot of positive feedback which he truly appreciated. “When people say that I was good in acting, kasi that was me eh, that was my character in real life, I was surprised that people accepted it. Naisip ko maybe as a person they'll accept me because that who I am talaga yung makulit, kenkoy and then fun to be with,” he revealed. Just like his role, Andre said he is a good friend. “In real life I'm the same, I'm an energetic person, the makulit person in the group because I like making people smile. Sometimes I hang out with friends who are always down because they have problems and I'm happy to say I'm the person who cheers them up,” he added. As the eldest son of actor-athlete Benjie Paras, Andre admitted he is used to being compared to his dad and said he is not bothered by it. “It's a coincidence I guess. I'm not following in his footsteps, I'm just doing what I love also. And then I guess we just ended up loving the same things and I'm actually enjoying it kahit na it's hard. Basta if you can handle it, that's what I got myself into it also. I don't really need to fill his shoes kasi it’s my own path and my dad's there guiding me. He's not forcing me to do anything lang. So I'm just enjoying everything because my dad doesn't say anything negative. He's just really happy, good or bad, even mistakes I just learn from it. So that's why I'm happy lang. I'm doing my own thing and my family, friends and also the fans are there to support me,” he said. Right now, Andre said he is taking his dad's advice when it comes to working in front of the camera. “He just said that these opportunities never come easy, if there's an opportunity then grab it and I did and he was there to guide me. He's the experienced one kasi he was doing movies when he was in the PBA so he told me, 'Kaya mo yan' kasi at that time I was stressing out from the schedule. Thankfully nga this project came in summer so hindi sagabal sa aking schedule so I accepted it.” he said.